On board of the ferry "Hua Hum" across Lake Pirihueico. 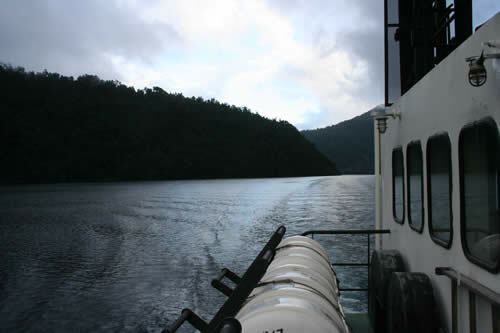 To get to or from the pass on the Chilean side, you have to take a ferry across Lake Pirihueico. The Hua Hum ferry runs every day between Puerto Fuy and Puerto Pirihueico and takes 1½ hours. For more info on the ferry service, check the Barcazas website. Please make sure you eat all fresh and dried food before entering Chile. It is prohibited to take it across the border.